Over the last six months or so, we've seen many many RPG kickstarter / indiegogo / crowd-funding campaigns come and go. Up till now, though I've been very close to supporting a few, I've never "bitten the bullet". My first support has gone to John Adams' Appendix N Adventures kickstarter! Why this campaign? ...I want adventures! After a lifetime of only running adventures I've written, I've recently started running bought modules as one-shots, outside of the on-going campaign, and have really enjoyed it! 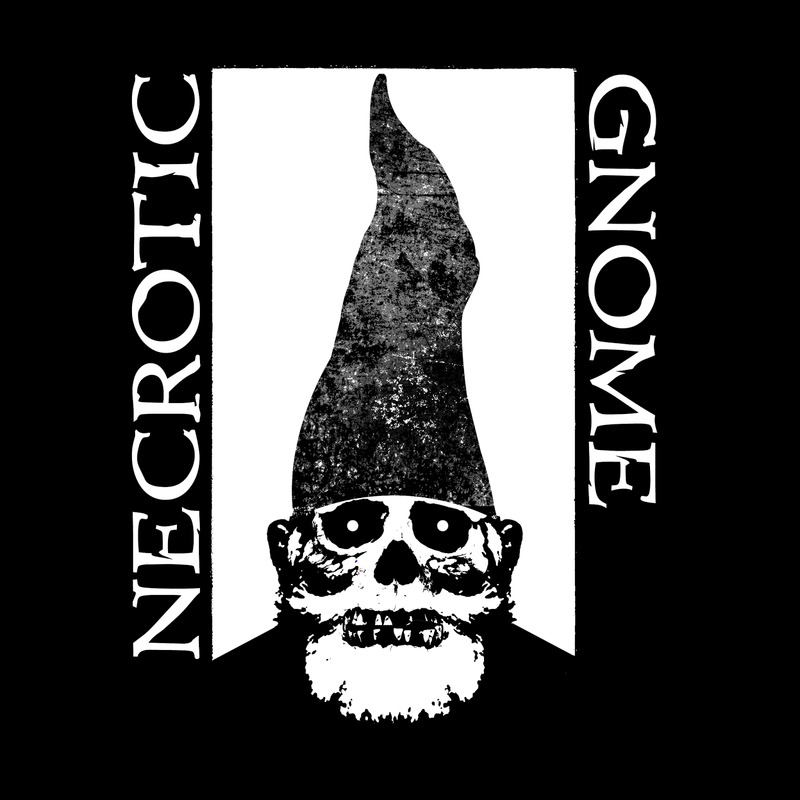 I don't own the DCC RPG (well, I have the beta PDF), so I guess I'd run the adventures with Labyrinth Lord or Swords & Wizardry, assuming they're easily compatible. John / Brave Halfling is a trusted name in the old-school scene, and from everything I've seen of him around on forums and so on, seems like a super nice guy. Even if only the basic goal had been met, we'd be getting two modules for $20, which is pretty good value I think. Now the campaign's nearing its end, we're getting six modules for $20 (the minimum pledge required to get everything), and possibly a campaign setting tying them all together, if the final stretch goal is reached! Now that's what I call amazing value! "Lots of folks have asked me why I set the “sweet spot” for this Kickstarter so low ($20) and how could I possibly be making any money off of it? That is a fair question and I would like to answer it here. In my 4+ years of hobby publishing I have learned a few things by trial and effort, by researching the industry, and by making many mistakes. This new line is exactly the kind of products I love to create! And this Kickstarter will enable me to create each of them in the quantities and at the level of quality I desire for them. For the first couple of years of BHP, I was able to fund projects out of my own pocket. But like so many people in our culture, I ended up being unemployed and underemployed for 13 of the last 24 months - and that reduced my ability to fund new projects. On the bright side, as our budget became tighter and tighter, my family and I have ended up spending more and more time playing games around the kitchen table. I know other families have as well. Times are still hard for many people. Each of these digest modules will retail anywhere from $5.95 to $8.95 (depending upon their size) and provide a session or two of gaming. That is very affordable. My goal for this Kickstarter has never been about making as much money as possible. Honestly, I am not sure using Kickstarter that way is very ethical. No, from the beginning, my goal has been to raise enough money to get this new line of products going and I am more than happy to provide all the modules and bonus goals in this Kickstarter to supporters at a greatly reduced rate (compared to the retail price) as my way of thanking them for providing me with the funds to release these modules in the quantities and at the level of quality they deserve." Following the Magus and Fighter, next up in the class roster (and, yes, I am just sticking to the "classic four") is my take on the Cleric. Regular readers and/or players in my games may be surprised to hear that I would even want to include a Cleric style class, as I am usually a notorious fun-spoiler where the class is concerned. However, I've always said that if I were to run a campaign in a setting which would suit some kind of holy warrior class, then I'd allow them. As I noted originally, these rules for D&D Mine are specifically tailored to a campaign setting which I'm working on. The setting is very much historically inspired, and, while it has fantasy elements like wizards, demons and undead, a Catholic style Church is an important element. Thus: what better excuse for an inquisitor / witch-hunter type Cleric class! I've had some trouble coming up with a good name for the class, and am as yet unsure about the name "Slayer". "Cleric" and "Paladin" are right out, as they bring too many expectations from traditional D&D, and imply an ordained clergyman or a knight in shining armour, neither of which describe this class very well. Other names I've considered include "Hunter" (thought that sounds like a woodsman), "Seeker" (but of what? ), "Warden" (again, a bit too game-keepery), "Arbiter"... If anyone has any suggestions, please go ahead! You are a warrior zealot, serving the Church in order to battle the evil forces of the world. Slayers often specialise in the rooting out and eradication of one particular kind of foe, taking on roles such as vampire slayers, witch-hunters, demon exorcists, inquisitors, etc. Slayers are typically not ordained priests, but can often receive aid and advice from the clergy. As warriors imbued with a holy purpose, Slayers are very capable combatants, being able to stand shoulder to shoulder with Fighters. Their faith also grants them access to a variety of miraculous abilities to help fight against evil. XP Modified by Wisdom: The Wisdom Modifier applies to XP gained by this class. Saving Throw: Slayers get +1 on saving throws vs. death and poison. Weapon/Armour Restrictions: Slayers have no armour or weapon restrictions. Divine Blessings: Slayers gain a number of divine blessings based on their Wisdom attribute. Blessings are chosen at 1st level and can never be changed. They are usable at will, without any limitation of a specific number of uses per day. Immunity to Disease: The Slayer is guarded by the divine, and is immune to all normal diseases. He or she also gains a +4 bonus to saving throws vs. magical diseases. Protection from Evil: The character gains a +2 bonus to saves against the powers of evil supernatural creatures, and has an effective armour class one point better than normal against their attacks. 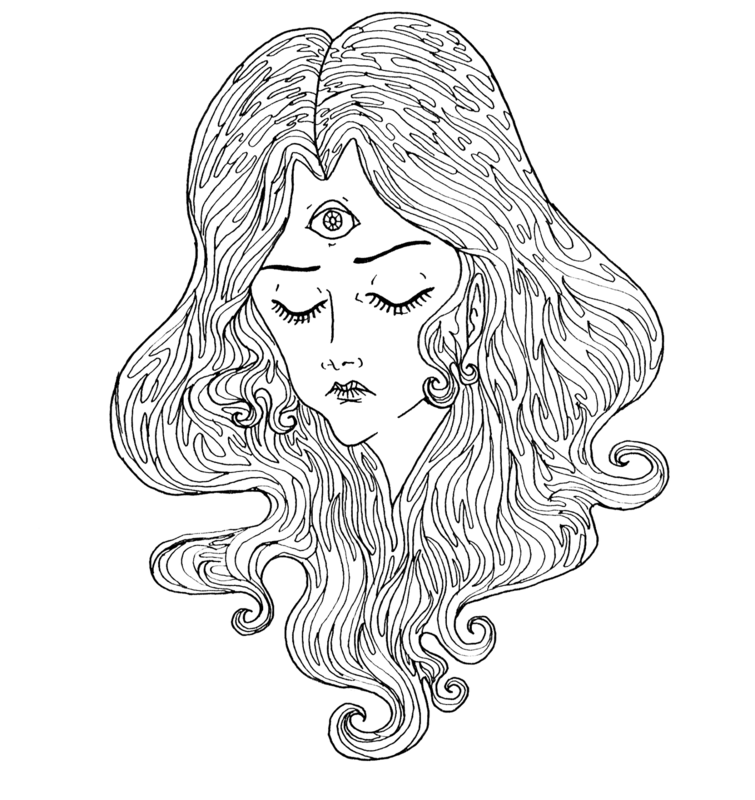 Reveal Charm: Possession or magicks of charm or mind control can be detected within 30'. One round's concentration is required. Sense Evil: The presence and magnitude of evil supernatural creatures can be detected within 30'. This takes one round of concentration. Smite Evil: The Slayer gains a +1 bonus on to-hit and damage rolls against a chosen type of foe. Succour: When resting, characters in the Slayer's presence regain one additional hit point, up to the maximum allowed per Hit Die (see Hit Points in the game rules chapter). Banishing Evil: Slayers can “turn” evil supernatural creatures such as demons and the undead, making them flee from the Slayer's holiness. See the chapter on Game Rules. Holy Benedictions: As a devoted servant of the Church, a Slayer of 2nd level or higher is able to receive benedictions by praying at shrines dedicated to the saints. Each shrine is dedicated to a certain saint, and each saint is able to grant a different benediction upon the faithful. See the chapter on Game Rules for further details. Many shrines and the benedictions of their patron saints are detailed in the Saints and Shrines booklet. Following on from Wednesday's post about the Magus, here's may take on the Fighter class. One point which might be noted here is how I'm giving each class some kind of benefit based on the prime requisite. These class-specific extras use the B/X style modifiers (+1 for 13-15, +2 for 16-17, +3 for 18), whereas the standard ability modifiers are of the Swords & Wizardry style (+1 for 13-18). So, for example, any character with Strength above 12 gets a +1 to-hit bonus, but only Fighters also get a bonus to damage from a high Strength attribute. Also note that the Fighter starts with a +1 base hit bonus. You are a warrior, trained in battle and in the use of armour and weapons. Perhaps you are a ferocious raider, a roaming mercenary, or a noble knight. Whatever type of Fighter you choose to play, you will probably end up on the front lines of your adventuring party, going toe-to-toe with the enemy, hacking your way through them and taking the brunt of their attacks. The Fighter character class is best equipped of all the character classes to dish out and absorb damage. You’re going to serve as the party’s sword and shield, protecting the weaker party members and taking down the enemies before you. Perhaps one day they will tell legends of your battle prowess, and followers will flock to your castle stronghold – where you revel in your fame, riches, and newly earned nobility. Fail, of course, and you will die – just another forgotten warrior in a dangerous world. XP Modified by Strength: The Strength Modifier applies to XP gained by this class. Weapon/Armour Restrictions: Fighters are trained in warfare and as such have no armour or weapon restrictions. Combat Might: Fighters are trained to use their strength to inflict extra damage in melee combat. Combat Specialisations: Fighters gain special bonuses in combat, due to their intensive training. Some possible areas of specialisation are listed below. At 1st level a Fighter can choose one of these specialisations. A further specialisation is gained at 3rd, 6th and 9th levels. Heavy Armour Specialist: The Fighter is so accustomed to wearing armour that he is less encumbered by it. He can reduce the encumbrance category of his armour by one (thus, heavy armour counts as medium, and medium armour counts as light). See Movement in the game rules chapter. Parry: The character fights with a defensive stance – his armour class in melee improves by 1, and he gains an additional +2 bonus when purely defensive in combat (see Parrying in the game rules chapter). These advantages are only gained when the Fighter is armed with a melee weapon. Resilience: The character has been through so much hardship that his body has toughened up. He gains an additional wound point. Shield Expert: When using a large shield (see equipment) the Fighter's armour class improves by an additional point. Specialist Weapon: +1 to hit and damage with chosen type of weapon. Surprise Attack: When making a melee attack by surprise, the character inflicts an additional die of damage. Two Weapon Fighting: Training in this fighting technique allows the Fighter to choose to gain an armour class bonus of 1 instead of the usual +1 to-hit bonus for wielding two weapons (see Two-Weapon Fighting in the game rules chapter). This option may be chosen on a round by round basis. Theorems & Thaumaturgy: Nearly There! I've just received a batch more illustrations from Cadanse D, and added them into the document for the book. 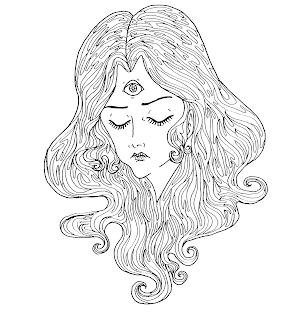 Above is her gorgeous illustration for the spell spying sigil. Having included all this new artwork, I exported a PDF of the book and scanned through it to get an overview of how many illustrations there are now, and how well distributed they are through the text. I was delighted to find that no more than two pages pass now without an illustration! And I'm still expecting ten or so more illustrations from another artist. It's going to be a very good looking book! Here's a small sample from the work-in-progress with my early Modern inspired D&D Mine. The Magus class is fairly close kin to the standard magic-user, but has altered, non-Vancian, mechanics for spell casting, and a simple system of spell acquisition. The Magus is a mysterious figure, a student of arcane powers and spell casting. Usually cloaked in robes woven with mystical symbols, Magi can be devastating opponents. However, they are usually physically weaker than other adventuring classes, and are untrained in the use of armour and weapons. As Magi progress in level, they generally become the most powerful of the character classes, but at lower levels they are quite vulnerable and must be protected by the other party members. Perhaps one day, though, you will rise to such heights of power that you can build a mystically protected tower for your researches, create fabulous magic items, and scribe new formulae for hitherto unknown spells. Such arch-mages can sway the politics of kingdoms, and command respect and fear across the realms. XP Modified by Intelligence: The Intelligence Modifier applies to XP gained by this class. Saving Throw: Magi get +2 on saving throws vs. magic. Weapon/Armor Restrictions: Magi tend to spend their waking hours in study of arcane tomes and scrolls, and as such tend to not have much training in combat. They may use any weapons, but suffer a -2 penalty to hit with all weapons except daggers or staves. Likewise, while Magi may wear whatever armour they choose, their lack of training means that they gain no benefit from it – the protective benefits being negated by the unaccustomed bulk. Spell Casting: A Magus has mastered the formulae for a number of spells depending on his level. These spells may be cast freely, but each time a spell is cast it fatigues the Magus, draining his hit points (see Game Rules). Starting Spells: A starting Magus has learned his initial spells either from an Arch-mage or from studying a spell book or arcane library. The player should choose one of the spell books, libraries and Arch-mages which are described in the magic booklet. The Magus' initial spells are then determined randomly by rolling on the list of spells available from the chosen source. Learning New Spells: Upon gaining a level a Magus is able to learn new spells, according to the known spells table, from any available sources. If a Magus has no available sources he will have to wait to learn new spells. Specialist Knowledge: Magi spend much of their lives absorbed in the study of obscure and esoteric areas of knowledge. From his education, a Magus character can choose a number of specialist areas of knowledge, based on his or her Intelligence attribute. These are fields of study which the character has researched during his or her education, and represent learning far beyond what is common knowledge. Instead of an area of specialist knowledge, an additional 1st level spell can be chosen, if the player wishes. Some example areas of specialist knowledge are given below, but players and Referees should feel free to invent others. The use of these areas of expertise is left open to interpretation and improvisation. Alchemy: The study of the physical substances of the world, and how their admixture and transformation can give insight into the world of spirit. Ancient History: Detailed knowledge of the history and legends of one or more ancient cultures. Ancient Languages: A Magus with this specialism would not be penalised when making Language skill rolls to understand ancient or dead languages. Arcane Languages: Various esoteric languages, which fall outside of the scope of the Languages skill, are possible areas of study for a Magus. Examples would include Faerie or angelic tongues, or the languages of birds or burrowing animals. Astrology / Astronomy: An intimate knowledge of the stars, planets and constellations. The Magus may be able to perform minor divinations by studying the night sky. 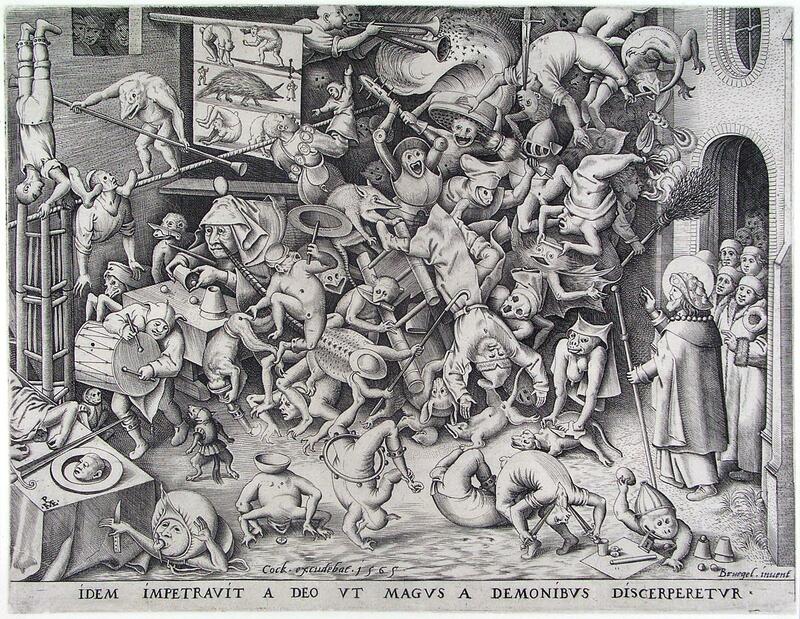 Demonology: Study of the various types and ranks of demons, and their powers and vulnerabilities. Herbalism: Knowledge of wild and cultivated plants, and their effects on the human body. Medicine and Anatomy: The study of the human body, its organs and their functions. Undead: Study of the various types of undead creatures, and their powers and vulnerabilities. D&D Mine -- It begins! After musing on this idea back in April, I've now begun to work properly on a complete D&D rule book for a future campaign. 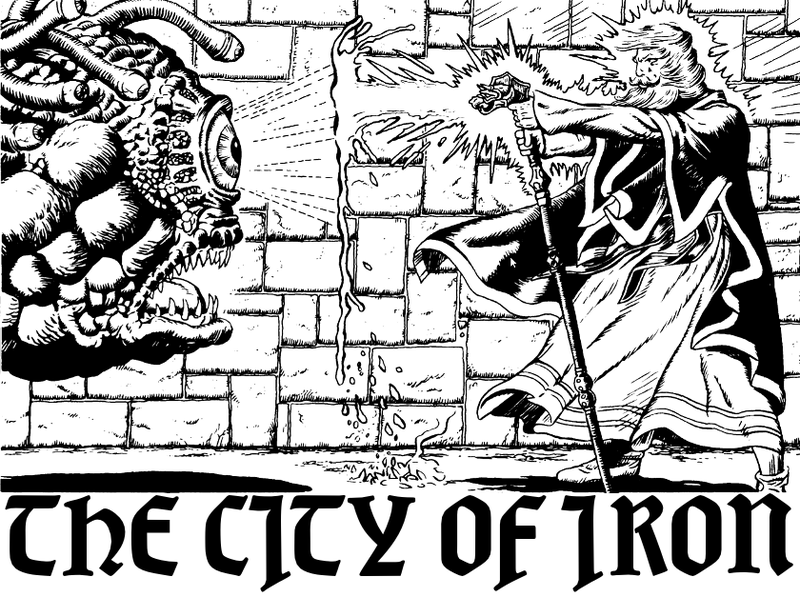 I've taken the Swords & Wizardry core rules document as a starting point, and started hacking away... What fun! What I'm thinking is that making a pretty decent set of rules booklets based on the S&W rules is so simple that each campaign can easily have its own. I usually find that each idea I have for a campaign comes with a set of house rules, alternative or disallowed classes & races, new spells, etc etc, so being able to relatively quickly write them all up into a proper rules document seems like the perfect way to go. So this is not so much "D&D Mine" as "D&Ds Mine". The current D&D Mine is a rules set for an early modern inspired, low fantasy setting which I tested out a bit with my recent running of the Grinding Gear. Last night I ran the third and final part of James Raggi's "The Grinding Gear". Some spoilers follow, so if you think you might play this adventure at some point, it's advisable to not read any further in case you spoil the surprises for yourself. Despite James' advice that the module should be played in one single session if possible (and we did try! ), we ended up playing the adventure in three parts, due to real world time constraints. In the first session a small group of three adventurers explored the abandoned inn and the surrounding buildings in great detail, and ended up finding the entrance to the dungeon. The second session saw a large group of six PCs delving into the dungeon, making their way through the 1st level and finding the entrance to the 2nd. Last night's session concluded the adventure -- they found their way to the end of the 2nd level of the dungeon, and managed to escape with their lives (and some small amount of treasure). The three sessions totalled about 20 hours of play. Admittedly, the first session involved about an hour of introduction, explaining the basic rules to a new player, and equipment buying for the others, as did the second session when two new players joined us. Nonetheless, even subtracting this "setup" time and time we took for breaks, the adventure itself must have taken us a good 16 hours to play through. Therein lies its biggest flaw, in my opinion; but I'll come to that later. Overall I have to say I was very impressed with this adventure, and really enjoyed running it. For referees who like to present a challenging and mysterious environment and enjoy watching their players trying to puzzle it out (and knowing that there really is a rationale behind it all! ), this module is a real treat. I loved the background premise, of a trap-filled tomb designed by a devious engineer and tinker with a love / hate relationship with adventurers. 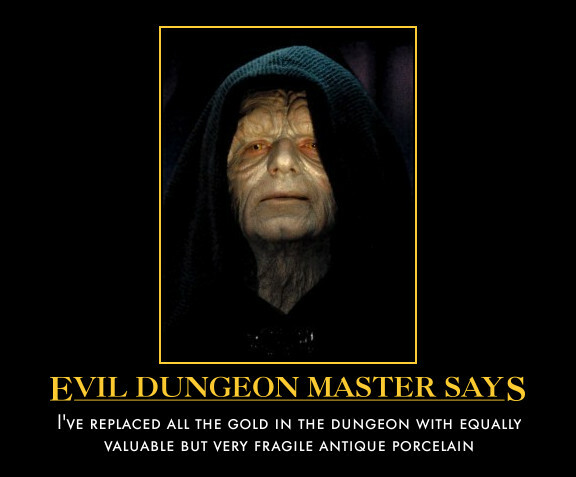 My players never quite worked out what the "point" of the dungeon was, i.e. 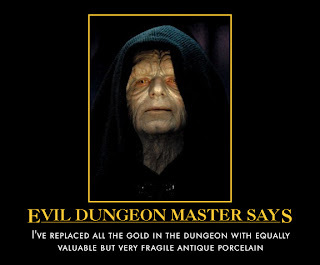 that it had been expressly designed to punish the foolish or rash, and to reward the clever and methodical, but they got a very clear feeling that there was a deliberate intelligence behind everything they were encountering, and indeed were constantly on their toes, expecting to encounter the dungeon's "caretaker" at any moment. The pace of the adventure is very slow, encouraging a savouring of small details and the pervading sense of malice and mystery. It rewards in-depth exploration of even areas which at first appear to be meaningless. For example, even for a group who were to figure out early on how to get into the tomb, exploration of the apparently empty and abandoned surface area is essential. Fortunately for them, my group didn't explore the statue hiding the dungeon entrance until last, being put off by the pile of dead bodies around it, and went over the abandoned inn buildings in great detail. I dread to imagine the fate of a party who were to go straight for the statue and simply jump head first into the dungeon! The revelation that the PCs were trapped, at the point where, after exploring every inch of the 2nd level which was shown on the fake map, they decided to head back to the surface to rest. This really had impact, especially as it dawned on them that they didn't have much water with them (and then they realised why I'd been mentioning all along when they felt hungry, and making them cross off rations and water supplies). That they ignored the organ trap, going straight through the door without touching the instrument, only to return and end up activating several of its nasty side-effects by playing random tunes on it. Their realisation, upon reaching the first of the real electrocuting cage puzzles, that they had no memory of the landlord's wife's name (I'd even shown them a little handout of the smashed funeral urn twice!). In the end they managed to work out her name by trial and error, "hangman" style, which surprised me -- I really thought that would be their end. That they fell for the final trick -- a heavily armoured fighter leapt into the sarcophagus, smashing its precious contents. The evil DM part of me was extremely pleased by this. At this point the first line of James' introduction rang true -- "is it OK to have a reasonable expectation for failure in a fantasy role-playing adventure?". Sure, the PCs escaped with their lives (which was looking like a far from certain proposition at several points), and took a small quantity of valuables with them, but they clearly understood that a rash action had robbed them of the tomb's principal reward. So, all in all, a thoroughly enjoyable module to run. The only flaw of the module as written, I feel, is that it's just unrealistic to run it in a single session as is advised, and that it's unfair to stretch it out over several. As I mentioned above, it took us about 16 hours altogether to play through it, and I really can't imagine how it'd be possible to play through it in a single session -- even a whole day session of 8 or so hours (which is what I'd originally arranged). Given that rushing the adventure -- especially the apparently uninteresting early parts -- would also be unfair, this leaves me slightly unsure of how to remedy this problem. For those of high constitution, an all-nighter or all-weekender would work well, but me and most of my players don't have the time or energy for such intense bouts of RPGing. I'd be truly interested to hear if anyone has actually run this module in a single session. The introduction implies that at least the author did! Firstly, this module presents a very special type of adventure which one would seldom create on ones own, and in that sense I would wholeheartedly recommend other referees to purchase it. However, while we got a great deal of enjoyment from the module, personally I don't feel like I'd run it again as written. More likely I'd try to come up with a shorter adventure of my own with the same premise -- one that could really be played through in a single session. From the world of drifting semi-conscious morning thoughts comes this proto-system for playing James Raggi's weird fantasy RPG without the normal D&D concept of levels and experience points. This is an idea I've been thinking about for some time, and the following is my first rough attempt at a system for it. Start your PCs off with the equivalent abilities of whatever level the referee deems a suitable starting "power level" for the campaign. They may be novice adventurers (1st level), or may be more capable in their chosen professions. Instead of characters' skills and abilities automatically improving through the course of their adventures, this system assumes instead that long periods of time are required to hone skill -- the typical timespan of an adventure (a few days or weeks perhaps) not being sufficient. Of course time is also money, to at least some degree. It is thus envisioned that characters will advance in more meaningful ways -- deliberately choosing to hone the skills they feel they need to achieve their goals (whatever those may be), rather than simply getting "free stuff" when advancing in level. In situations where a campaign goal is pressing urgently upon the PCs, personal advancement may simply not be an option -- in this case other possibilities must be explored by characters (acquiring the aid of NPCs who do have the required ability, for example). The basic mechanism is that a certain time period must be spent in training of some kind, and that a roll of Xd6 against a relevant attribute (roll under or equal) determines whether the training was successful. The number of d6s rolled is determined by the level of the ability which the character wishes to advance to (i.e. the step above his or her current ability level), making it more and more difficult to advance as the character's ability improves. The training roll can be attempted any number of times, although each attempt entails a length of time. A specialist can improve any skill by rolling Xd6 against a related attribute (referee's call), where X is one greater than the current level of the skill. (For example, a specialist with 3 in 6 stealth would have to roll equal or under their DEX on 4d6 in order to advance.) The exact nature of specialists' training is open to negotiation -- this makes some skills easier to train than others (it's easy to imagine how a character could improve at foraging and hunting, but how exactly does one improve at searching?). Depending on how the referee handles known spells for magic-users, they may be required to make a roll against INT on Xd6 to learn a new spell, where X is the level of the spell. Fighter attack bonus: one month. New magic-user spell: one week. In the long term this will, of course, mean that higher levels of expertise are harder to reach, as the training roll increases in difficulty, requiring on average more attempts to succeed. Training time must be spent pretty much devoted solely to that activity. In periods of down-time between adventures, PCs may have other responsibilities, and thus may not typically have the time required for training, without making special arrangements. Special circumstances may give a bonus to a training roll (i.e. effectively increasing the relevant attribute for the purposes of the roll). The referee may grant a bonus from things like expert tutelage (which will naturally cost money) or consulting tomes or libraries (for spell casters). Over the course of a long adventure (weeks or more) during which a character has regularly and intensively practiced a skill, the referee may allow a training roll to be made. A short jaunt into a dungeon would not usually qualify, but a three week long military campaign (in the case of a fighter) may. The assumption is that "adventures" are, in general, short bursts of intense activity dotted through the normal lives of PCs. What About Hit Points and Saving Throws? Good question... I'm not sure about that yet. Any ideas? One could of course simplify this whole thing into a "roll to advance a level" system, but I quite like it being a bit more fine-grained than that. Last night saw the first session of my new mini-campaign, a vaguely H. P. Lovecraft inspired investigative affair set in London in the year 1890. The PCs are all members of a secret club calling itself "The Society of the Squared Circle", based in private rooms at London's Oriental Club. They have found themselves involved in a murder case, coming to the support of a young doctor who, at first glance, doesn't have a leg to stand on -- he was witnessed killing a woman with his bare hands and then collapsing unconscious by her side until being apprehended by the police. However, all is, of course, not as it seems. The group have begun to uncover some unusual aspects of the case, and have lots more digging planned for the next session. This was several firsts for me: first time running a campaign set in the real world, first time running a game in a modern(ish) setting with electricity and guns and so on, first time running a proper investigative adventure. So far I have very much enjoyed the setting -- it's been a real breath of fresh air after running a relatively typical D&D campaign for the last 18 months! I also like the Victorian period on practical RPG grounds. It is close enough to living memory, and has enough modern technology to be not too unfamiliar to players, while not having advanced so far that problematic things like widespread mass communication, the internet, and so on make designing an investigative scenario tricky. One aspect of playing in a historical real world setting which was unusual for me was the balance between making things up and looking things up. I'm used to running completely home-brewed fantasy campaigns, where I, as DM, am free to just make up anything on the spur of the moment and have it become "campaign canon". Not so in a historical setting. We are lucky enough to have a player who is pretty knowledgeable about history, and the Victorian era / the British Empire specifically. This helped a lot when questions came up (and many did!) about "did they have X at that time? ", "was Y common knowledge then? ", etc. Thanks Steve! Actually this is something I really enjoyed -- that the game felt a bit more collaborative than usual, with players being able to contribute as much to the atmosphere and background as I was. Oh one final fun thing I'd like to share about the campaign: as we're a group of very mixed nationalities (English, German, German/Russian, Dutch, Italian, Belgian), I suggested that it'd be fun for everyone to play a character of their own nationality. This has worked out very well, adding the players' knowledge of their own countries' history to the pool of background flavour. Thus we have a Dutch electrical inventor, a German doctor / polar explorer, a German industrialist, a Russian noblewoman and occult dabbler, a Belgian diplomat, an Italian mobster (named Michael Corleone!) and an English arabist.